If I'm not reading, there's a good chance I'm cooking. As someone with little to no artistic ability, cooking provides a much-needed outlet for my creative impulses, and prevents the people in my life from receiving the adult version of glitter and macaroni art for Christmas. Particularly as I've grown up and abandoned the fussy eating and narrow-mindedness of youth, I've begun to explore different tastes and textures, and to embrace as wide a variety of fresh ingredients as possible. The first experience I remember with international cuisine was Greek food. I was about eight years old, and my parents had taken me to the big city to see Andrew Lloyd Webber's production of Cats (I adored it and put my parents through weeks of abject misery with the resulting off-key renditions of Memories). When presented with the idea of going to a Greek restaurant for dinner, I sulked and whined and complained. I wanted a hamburger. But my parents had a secret weapon – the restaurant had a belly dancer. The allure of spangled scarves and dancing was more than I could refuse, and I grudgingly acquiesced. By the end of the night I had eaten kalamata olives, and garlicky houmus puddled with extra virgin olive oil. I had eaten stuffed grape leaves and lamb. Bravely, I had even eaten rings of squid. Even the items I didn't immediately love sparked something in me – an interest in food as something to experiment with, enjoy, and be creative with. I remember that night as possibly the first time I took a real interest in cooking and regional cuisine. And the belly dancing was wonderful. I first tasted salsa after great cajoling from my stepfather, who presented a plate of crackers and cheese that had been desecrated by some chunky, gross-looking red stuff. I'm sure he regretted his actions when I started putting it on everything and going through a jar a week. That was the beginning of my love of spicy food, and different flavors. The tomatoes, onions, peppers, garlic, and vinegar were a new combination to my young tongue, and opened a door of possibilities. Soon I agreed to taste cilantro, and avocado, shrimp and mango, fennel and even mushrooms. I was hooked, and began to take an interest in cooking. 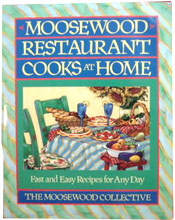 One of the first cookbooks I remember using was the Moosewood Restaurant Cooks at Home, a largely vegetarian collection which offered intriguing combinations and ingredients from the Moosewood Restaurant in Ithaca, New York. I remember especially liking the Caribbean Vegetable Stew, before which I could not have picked okra out of a vegetable lineup. Another cookbook I have used regularly and loved for many years is the Rebar Modern Food Cookbook, which comes out of a local restaurant here in Victoria, British Columbia. Again largely vegetarian with many vegan options, these recipes are creative and healthy with an emphasis on flavor and freshness. Their peanut sauce is to die for, and their soba noodle salad is one of my favorite things. Growing up in west coast Canada, it's almost impossible to avoid being exposed to a wide variety of cultural cuisine, since we are a relatively young country and have little established cuisine of our own. We have French Canadian fare, exemplified by spiced pork pie (Tourtiere), poutine (french fries with gravy and cheese curds), and more; we have traditional foods from the First Peoples of Canada such as bannock (a flat fry bread), and pemmican (any mixture of dried meat, fat and whatever else was on hand such as berries or other fruits), and the tongue-in-cheek examples like maple syrup and Canadian bacon, but really, we don't have a strong national palate and repertoire here, like China, or India or Mexico. And as a result, I grew up learning about and eating food from everywhere. When I was about 12, my parents and I took a road trip to California. To entertain myself, I counted Denny's restaurants, as I'd noticed there were a lot of them in the U.S. - and between the way down (on the coast 101 Highway) and the way back (on the I-5), I counted over 50 of them. Fortunately, we didn't stop at a one (though my poor parents did give in to my begging to try an International House of Pancakes. They were right; I admit it. ), opting instead to try local restaurants, as unique to the area and local as possible. The most memorable meal I ate on that trip (aside from my breakfast one morning of an orange, plucked right from the tree of my parents' friends - oh, California) was at a restaurant in Big Sur called Nepenthe (which in Greek means "isle of no care"), where we stopped for lunch. Seated high above the Pacific Ocean, we munched contentedly on fresh, homemade, creative food (even the salad was delicious), while Stellar Jays circled and scolded us, demanding we feed them. It was a gorgeous experience, and made me appreciate how different food could be from place to place, when one avoids chain restaurants and opens their mind. Learning to cook, I began to understand and appreciate the different nuances, methods and ingredients utilized by chefs – both professional and casual – all over the world. The clarified butter, fragrant rubs and seed roasting of Indian cooking, and the marvelous things they do with yogurt; the inventive and impossibly fresh methods of seafood preparation employed by Japanese chefs; the fragrant and flavorful broths and salads in Vietnamese dishes, utilizing papaya, lemongrass, hot peppers. I love it all. And with today's global economy and easy access to shared information, the smells, tastes and nutrients of recipes from another country are easily right at our fingertips. These are some of the best regional and specialty cookbooks available today as we see it. to help you perfect your curries and bouillabaisses, fricassees and stews. Some are traditional books of recipes, some have anecdotes and history as well, and all are delicious. The executive chef of Washington State's Herbfarm Restaurant presents one hundred easy-to-prepare recipes. Bon Appétit, Y'all is a modern Southern chef's passionate and utterly appealing homage to her culinary roots. My Nepenthe weaves together stories and tales about the famous California restaurant perched on the majestic cliffs of Big Sur. Seattle! Here you'll find everything from Japanese bento box lunches and Thai satays to steaming bowls of Vietnamese soups and all-American blackberry cobblers. A celebration of the food, flavors, spices, tradition and culture found along the Mexican border. Enjoy the food, drinks, and lifestyle of the Mediterranean, inspired by the Barcelona Restaurant and Wine Bars in Connecticut. Cucina Piemontese includes recipes for more than 95 Piedmontese dishes, many of them from the author's family in the Piedmont region of Italy. A collection of Newcastle and Durham local recipes that show that Geordies dont just eat fish and chips. Once Upon a Tart offers 225 recipes from the eponymous Manhattan shop, which, in addition to sweet and savory tarts, prepares delicious soups, salads, and muffins. Organized by regions, Oaxaca al Gusto presents some three hundred recipes--most from home cooks--for traditional Oaxacan dishes from Mexico. San Francisco chef Judy Rodgers provides recipes for Zuni's most well-known dishes, ranging from the Zuni Roast Chicken to the Espresso Granita. A celebration of the amazing food culture and restaurants of Vancouver, the Lower Fraser Valley and southern Vancouver Island, featuring 50 of the areas best-known, award-winning chefs. In West Vancouver, people flock to the comforting French country fare served at Chef Alain Rayé's award-winning bistro, La Régalade. African, Indian, Chinese, and British culinary influences come together in a unique Trinidadian blend. Potjiekos (a stew prepared outdoors in a cast iron pot) is hugely popular with South Africans who love entertaining guests around a fire. In over 125 recipes, the secrets behind some of the Palm Restaurant's most requested dishes are revealed by executive chef Tony Tammero. The Basque Kitchen, with photographs of the Basque region and its dishes, is the first major cookbook to explore Basque cooking on both sides of the French-Spanish border. The Crescent City Farmers Market Cookbook incorporates renowned New Orleans chefs' recipes, as well as family favorites from market vendors and shoppers. Fabulous Fairholme will transport readers to Victoria's elegant inn, capturing the magic of its delicious breakfasts and brunches. This cookbook, Keller's first, is as satisfying as a French Laundry meal, a series of small, highly refined, intensely focused courses. A delicious cookbook for health-conscious cooks that emphasizes an organic, natural approach to good eating, with anecdotes, letters, and vintage photographs of the world of the American cowboy. Bill Granger explores the whole food culture in Sydney, from the food trends to beachside eating society. Collected from all five boroughs by New York Times food writer Molly O'Neill, here are over 400 recipes and 500 photos that celebrate one thing--a passion for food and eating. A collection of authentic recipes and menus from every era of Newport, Rode Island's fabulous history. Barbara Tropp, the Julia Child of Chinese cooking, invented Chinese bistro--a marriage of home-style Chinese tastes and techniques with Western ingredients and inspiration.